There are many alternatives to choose from when it comes to the most looked after dessert that is served at couples’ wedding reception table: the wedding cake. While this wedding reception important element represents the signature of many couples’ ideas to uniquely present this bakery masterpiece inside the unfolding of their reception, they would look not only for the design and decorative style, but also for the taste of it that should be on the list of preferences of their wedding guests. Cheese wedding cakes can be such an example which is not only tasty but it is on the top favorites of many wedding couples and not only. In the recent wedding celebrations, cheese cakes have become more popular only if you think of that tasty cheese stacked in tiers and after that decorated with fresh flowers or fresh fruits in colors that match the color scheme of your wedding event. The alternative of cheese wedding cake is a savory alternative to the traditional fruit cake as it is very often preferred for its different taste and way of presentation. As a future bride you have the chance to consult with the chosen baker and cake decorator in order to finally reach to the format that you envision having for your special wedding reception dessert. There is also a service provided to deliver and set up the cake at the reception venue arranging as such the presentation in accordance to the venue requirements. Celebrating your wedding in UK you can amaze your guests with the Stilton cheese wedding cake created by famous cheese producers with layers of white and blue Stilton blended with apricots or blueberry to obtain a great visual effect and of course, a delicious taste. At House of Cheese UK, you can as well find a wide selection of cheese cakes created by award-winning cheese monger at prices that make them very affordable. 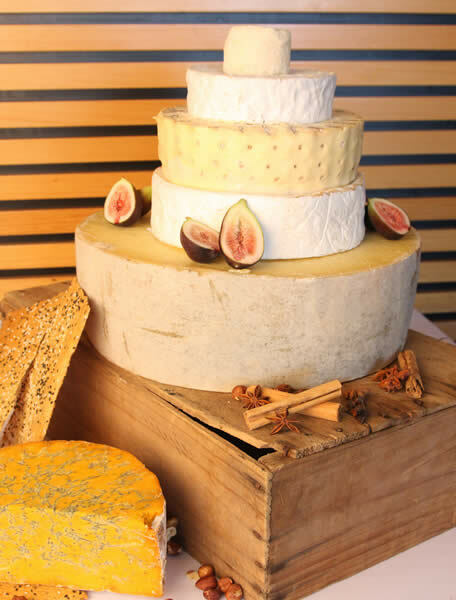 With Norbiton Cheese UK you can get your cheese wedding cake made with artisan and farmhouse cheese selected from the best producers throughout Europe and British Isles. The company will assist you through the choice of your cake guiding you to what can work and what doesn’t work helping you to make the day as special as possible. But why cheese cake? Many wedding couples decide on this type of cake simply because they are not fan for chocolate, marzipan or other ingredients that are included in a traditional cake. At Norbiton you can select the kind of cheese they have in stock with every cake customized in accordance with your desire and budget. 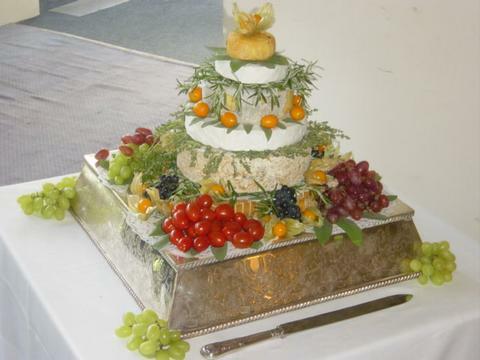 One affordable option provided by Nortbiton Cheese UK is a smaller version of cheese wedding cake consisting of Cornish Yarg cheese, followed by Colston Bassett Stilton tier and on top of it the tier of Coulommier – a soft type of French that can cost around 130.00 pounds for around 50 guests. There is as well the alternative of garnishing these cakes with fresh flowers or fruits along with a ribbon wrapped around each tier of your cake. If you look for a difference in the celebration of your wedding reception, you can definitely resort to cheese wedding cakes to really make a statement in this respect. Many couples choose as decorative touches the presence of grapes that go very well with the taste of cheese. In case you want to go for organic cheese as an option for your wedding cake, you should visit Fancy That Wedding Cakes UK and see what they can offer to you in this regard. The fruits that decorate the cake are also organic, so you should check with the price that goes up to 350.00 pounds for a three tier wedding cake with the decorative style included in the order. Many times the option of cheese wedding cake comes as an additional cake to the traditional one serving guests with various types of cheese that go well with the wine you have ordered at the table. The presentation of this option goes mostly with assortments of cheese that is richly ornate with fruits and displayed on a wooden board that matches perfectly with this choice. Other couples would select this alternative for their country style wedding celebration or the fall themed wedding festivities. The beauty of this thing is that it can hold successfully any kind of decoration you might think of conferring cheese wedding cake the style that you have been after right from the beginning.